Soak the peas over night in 3 cups of water. The next day, drain the water and cook the peas in the pressure cooker with 4 cups of water and 1 tbsp Oil for 15-20 mins. (Oil helps reduce the foam from the beans as well as helping keep the skins from popping off and clogging up the vent tube.) The peas should be soft but not mushy. Heat Oil in a pan. Add the cumin seeds, cinnamon stick, cardamon and bay leaf and fry for 5-10 secs. Then add the chopped onions, ginger and garlic and fry for couple of mins till the onions become tender. After the onions become light pink, add the diced potatoes and stir fry for 5 mins till the potatoes become light brown. Add the tomatoes, chilli powder, turmeric, cumin powder,coriander powder, salt and stir fry for 5 mins. Add the tamarind paste and mix well. Garnish with chopped onions and coriander and serve. Note : If you are using lemon juice instead of tamarind paste,then add the lemon juice in the very end, when the dish is ready. In a typical Bengali dish, chopped coconut is also added but since my kids are not fond of coconut so I have omitted it in this recipe. 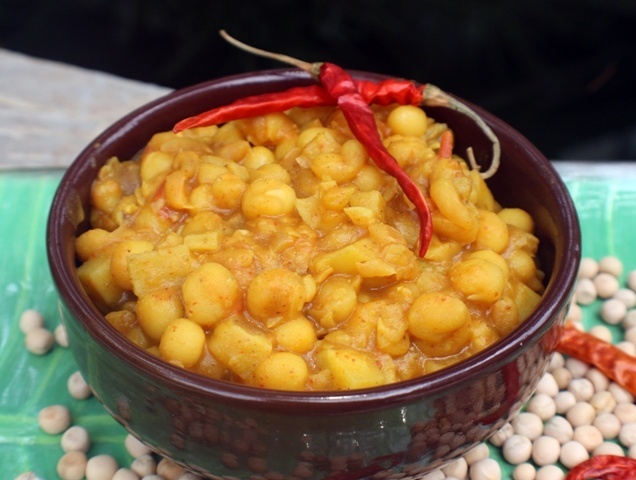 This entry was posted in All Recipes, Pulses & Beans and tagged Curried Peas, Ghugni by Kamakshi. Bookmark the permalink.